In September 2000, the U.S. Food and Drug Administration approved mifepristone to be marketed in the United States for nonsurgical abortion. According to U.S. Food and Drug Administration guidelines, medication abortion is approved for abortions up to 10 weeks’ gestation. The protocol involves two drugs—mifepristone and misoprostol—one of which can be taken at home following a provider visit. Since recognizing a woman’s constitutional right to abortion in 1973 in Roe v. Wade, the U.S. Supreme Court has in subsequent decisions reaffirmed that right. The Court has held that a state cannot ban abortion before viability (the point at which a fetus can survive outside the uterus), and that any restriction on abortion after viability must contain exceptions to protect the life and health of the woman. Furthermore, any previability abortion restriction cannot create an “undue burden” by placing a substantial obstacle in the path of a woman seeking an abortion. This “undue burden” standard was established in Planned Parenthood v. Casey in 1992 and clarified in the 2016 decision in Whole Woman’s Health v. Hellerstedt. The latter affirmed that courts must consider credible evidence when evaluating the constitutionality of abortion restrictions and strike down measures that do not have tangible benefits that outweigh the real-world burdens imposed on women. In 2000, a total of 13 states had at least four types of major abortion restrictions, qualifying them as hostile to abortion rights.25 By 2017, 29 states met this definition.26 The proportion of U.S. women of reproductive age living in hostile states rose from 31% to 58% during this time period. In contrast, the number of states that were supportive of abortion rights fell from 17 to 12 between 2000 and 2017.25,26 The proportion of women of reproductive age living in supportive states declined from 40% to 30% over this period. 1. Finer LB and Zolna MR, Declines in unintended pregnancy in the United States, 2008–2011, New England Journal of Medicine, 2016, 374(9):843–852, doi:10.1056/NEJMsa1506575. 2. Jones RK and Jerman J, Abortion incidence and service availability in the United States, 2014, Perspectives on Sexual and Reproductive Health, 2017, 49(1):17–27, doi:10.1363/psrh.12015. 3. Jones RK, Jerman J and Ingerick M, Which abortion patients have had a prior abortion? Findings from the 2014 U.S. Abortion Patient Survey, Journal of Women’s Health, 2017, doi:10.1089/jwh.2017.6410. 4. Jones RK and Jerman J, Abortion incidence and service availability in the United States, 2011, Perspectives on Sexual and Reproductive Health, 2014, 46(1):3–14, doi:10.1363/46e0414. 5. 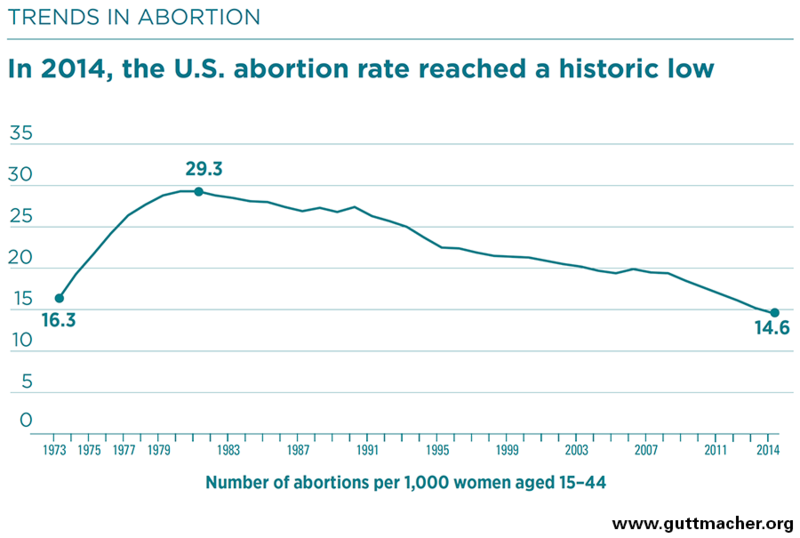 Jones RK and Jerman J, Population group abortion rates and lifetime incidence of abortion: United States, 2008–2014, American Journal of Public Health, 2017, doi:10.2105/AJPH.2017.304042. 6. Jerman J, Jones RK and Onda T, Characteristics of U.S. 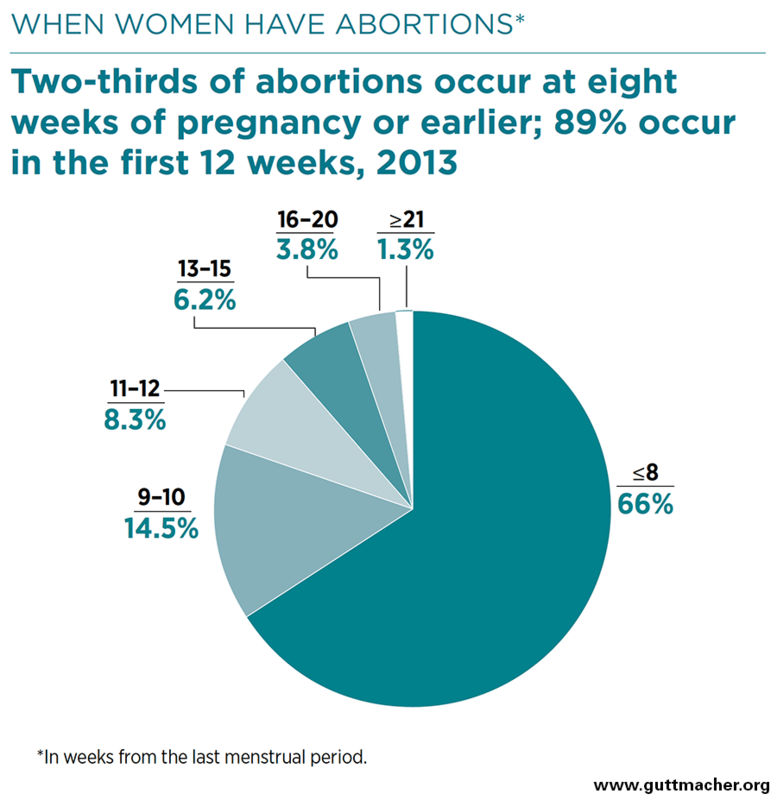 Abortion Patients in 2014 and Changes Since 2008, New York: Guttmacher Institute, 2016, https://www.guttmacher.org/report/characteristics-us-abortion-patients-2014. 7. Finer LB et al., Reasons U.S. women have abortions: quantitative and qualitative perspectives, Perspectives on Sexual and Reproductive Health, 2005, 37(3):110–118, doi:10.1363/3711005. 8. Jones RK, Reported contraceptive use in the month of becoming pregnant among U.S. abortion patients in 2000 and 2014, Contraception, 2018, doi:10.1016/j.contraception.2017.12.018. 9. Jones RK, Ingerick M and Jerman J, Differences in abortion service delivery in hostile, middle-ground and supportive states in 2014, Women’s Health Issues, 2018, doi:10.1016/j.whi.2017.12.003. 10. Jerman J and Jones RK, Secondary measures of access to abortion services in the United States, 2011 and 2012: gestational age limits, cost, and harassment, Women’s Health Issues, 2014, 24(4):e419–e424, doi:10.1016/j.whi.2014.05.002. 11. Jatlaoui TC et al., Abortion surveillance — United States, 2013, Morbidity and Mortality Weekly Report, 2016, Vol. 65, Number SS-12, https://www.cdc.gov/mmwr/volumes/65/ss/ss6512a1.htm. 12. Upadhyay UD et al., Incidence of emergency department visits and complications after abortion, Obstetrics and Gynecology, 2015, 125(1):175–183, doi:10.1097/AOG.0000000000000603. 13. White K, Carroll E and Grossman D, Complications from first-trimester aspiration abortion: a systematic review of the literature, Contraception, 2015, 92(5):422–438, doi:10.1016/j.contraception.2015.07.013. 14. Boonstra HD et al., Abortion in Women’s Lives, New York: Guttmacher Institute, 2006, https://www.guttmacher.org/report/abortion-womens-lives. 15. Major B et al., Report of the APA Task Force on Mental Health and Abortion, Washington, DC: American Psychological Association, 2008, http://www.apa.org/pi/women/programs/abortion/mental-health.pdf. 16. Zane S et al., Abortion-related mortality in the United States, 1998–2010, Obstetrics & Gynecology, 2015, 126(2):258–265, doi:10.1097/AOG.0000000000000945. 18. Donovan M, In real life: federal restrictions on abortion coverage and the women they impact, Guttmacher Policy Review, 2017, 20:1–7. 19. Boonstra HD, Abortion in the lives of women struggling financially: why insurance coverage matters, Guttmacher Policy Review, 2016, 19:46–52. 25. Gold RB and Nash E, Troubling trend: more states hostile to abortion rights as middle ground shrinks, Guttmacher Policy Review, 2012, 15(1):14–19. 26. Nash E et al., Policy Trends in the States, 2017, New York: Guttmacher Institute, 2018, https://www.guttmacher.org/article/2018/01/policy-trends-states-2017. Source: Calculated from the Centers for Disease Control and Prevention’s annual abortion surveillance summary (reference 11), with adjustments for changes in states reporting data. *Poverty guidelines are updated periodically in the Federal Register by the U.S. Department of Health and Human Services under the authority of 42 USC 9902(2).